We manufacture of dust mop, dust control mop cotton and acrylic material. With our in-depth knowledge and experience of this industry, we are engaged in offering an excellent quality Dust Mop Cotton. Manufactured using superior grade material and advanced technology in accordance with the set industry standards. Our offered Dust Mop Cotton is also checked as per the industry set parameters to ensure the entire range is free from any sort of production defects. Available at affordable prices, our offered mop is used to remove dust particles effortlessly from the floor. We have reached towards the path of achievements and growth just because of our capability of producing a highly qualitative range of Dust Mop Green. Designed by skilled personnel using optimum quality raw material, our products are widely getting applauded by the customers, which are spread across the nation. To examine the quality of Dust Mop Green, we have adopted several stringent quality testing parameters, which have been suggested by the industry. We also ensure customers to make shipment of consignment within predetermined time period. Pole Color Yellow, Blue, Green, Steel. With enormous awareness and understanding, we are presenting a comprehensive compilation of Acrylic Cleaning Mop. 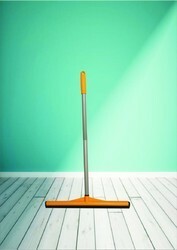 Used to clean floor, these products are widely demanded by homes, offices, shops, showrooms, corporate houses and hotels. This product is demanded to offer excellent finishing to the surface and is available at market leading price. 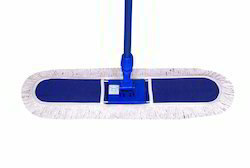 We are leading manufacture of Cotton Dust Mop. 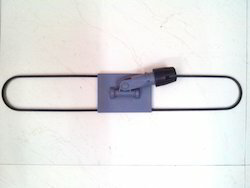 this is good quatlity cotton material produst used dirty dust suface cleaning area easy to used and best quality accessories like Holder Handle used by Hotel, Hospitals, MNC, Industries and More. Size Availble as for requirment. 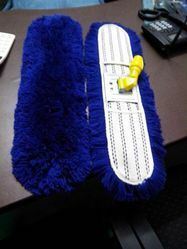 Acrylic Blue Dry Mop 80cm. We are leading manufacture of Acrylic Dry Mop Set and Refill. and all type mop mops like, Dry Mop Set Refill, Dust Mop Set Refill, Dust Mop Set Refill, Kentucky Mop Set Refill, Wet Mop Set Refill, Material Used Cooton, Acrylic, Microfiber and More. 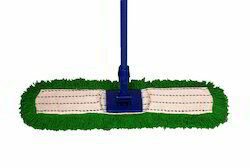 We are leading manufacture & supplier of cleaning mops & cleaning tools. With our in-depth knowledge and experience of this industry, we are engaged in offering an excellent quality Dry Mop Cotton. 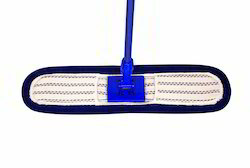 Manufactured using superior grade material and advanced technology in accordance with the set industry standards. Our offered mop is also checked as per the industry set parameters to ensure the entire range is free from any sort of production defects. Available at affordable prices, our offered mop is used to remove dust particles effortlessly from the floor. 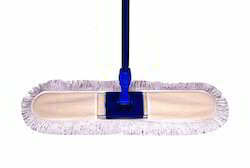 We are a well-known firm engaged in manufacturing and supplying a quality approved Dust Mop Acrylic . Our experienced professionals fabricate this refill using modern machines as per the set industry standards. The Mop offered by us is effectively used for cleaning hardwood, wood laminate, tile, linoleum, marble, Formica, stone, painted surfaces, etc. 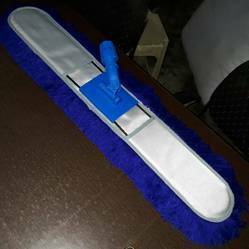 In order to fetch maximum satisfactions for our clients, our offered Dust Mop can be customized as per their detailed specifications. Backed by our skilled professionals, we are engaged in manufacturing and supplying an optimum quality Dust/Dry/Dust Control Mop Holder/Frame . With the support of our experts, our offered range is manufactured using advanced tools & machines in strict compliance with the international quality standards. The offered range of frames & clips finds their huge applications in various industries. Apart from this, we offer this to our clients in various specifications at reasonable prices. • 1st Best Quality Products in Plastic & Metal.